No one wants to deal with the visible effects of missing teeth — but did you know that tooth loss can also increase your risk of stroke? Many patients are surprised to find out that losing one or more teeth has drastic implications for their overall health. Research has shown that people with several missing teeth are more likely to have an ischemic stroke than those with 25 or more teeth (adults typically have 28 to 32 teeth). Your family dentist in Westfield knows the link between your oral and overall health is strong, and that’s why we recommend regular preventive care! Keep reading to learn more, then contact us to schedule an appointment today. What’s the Connection Between Stroke and Tooth Loss? In a study performed by the American Heart Association in the early 00s, patients who had many missing teeth were shown to be at a greater risk of stroke than others. 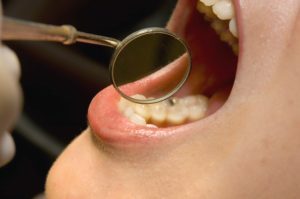 People who had the missing teeth also drank alcohol, smoked, and were less active than those who had more than 25 teeth. One surprising thing about the study, however, was that the stroke risk was actually higher for nonsmokers than smokers — suggesting that there is something else going on with the link between missing teeth and stroke aside from tobacco use. Follow-up research shows that the link adds to the evidence that experiencing tooth loss puts you at a greater risk of stroke — and that is not something to take lightly. Stroke is the leading cause of disability in adults today (causing issues like paralysis, inability to speak, falls, pain, and others), and 15% of people who have a stroke die. What Are Other Links Between Oral and Overall Health? People who have lost one or more teeth may be dealing with periodontal disease, the condition that has been linked to a number of serious health effects, including heart disease, high blood pressure, respiratory issues (COPD and pneumonia), and even memory loss. Pregnant women are at an increased risk of developing pregnancy gingivitis, usually a temporary and mild condition, but one that can turn into gum disease if ignored. Gum disease during pregnancy has been linked to low birthweight and an increased risk for premature birth. Your mouth is the gateway to the rest of your body, so keeping up with your dental hygiene habits is absolutely vital for enjoying a healthy smile and body for a lifetime to come. How Often Should I Visit the Dentist Near Me? Preventive dentistry is crucial for enjoying a healthy body — and you should see your dental team every six months. People who brush their teeth for two minutes, twice a day, floss daily, and visit their dentist regularly are more likely to enjoy better overall wellbeing, too. When was your last visit to Dr. Weinman’s office? If it’s been longer than six months, you’re missing out on necessary preventive care. Schedule an appointment today!